And here are the runner-ups! 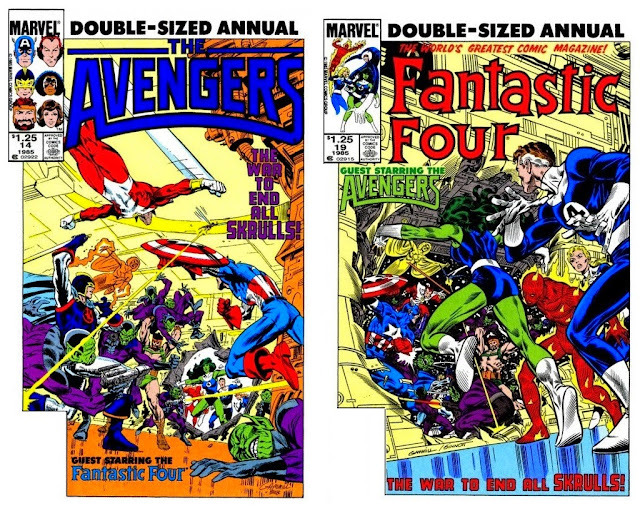 Truth be told, the late 1970s were a great time to be a fan of Ultron. 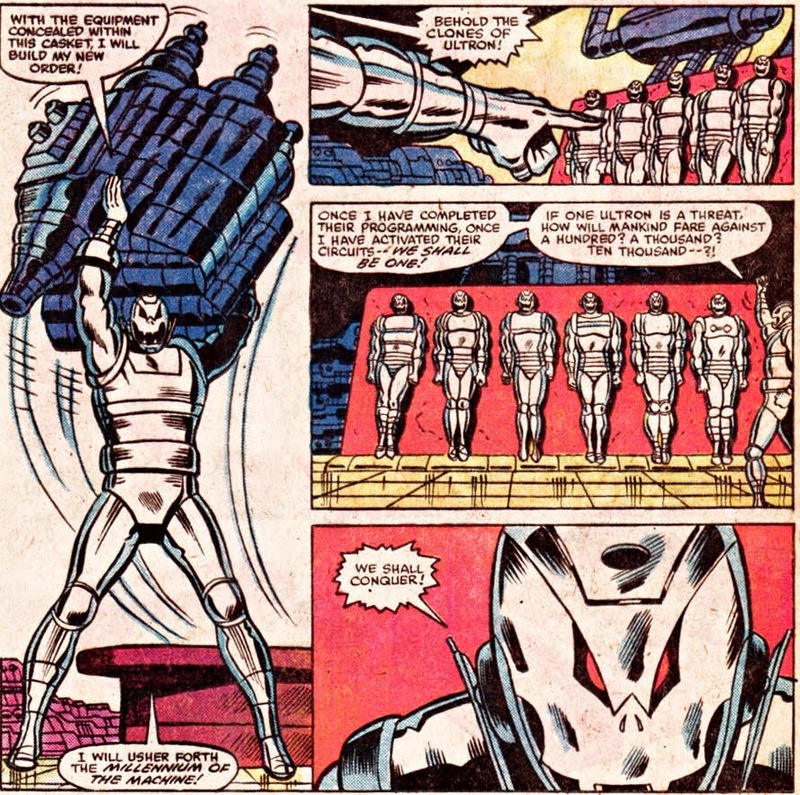 After the character made a spectacular debut in 1968, he laid low for the first half of the 1970s, only making a bit of a splash when he mounted his head on top of the giant robot Omega to mess up Quicksilver and Crystal's wedding. 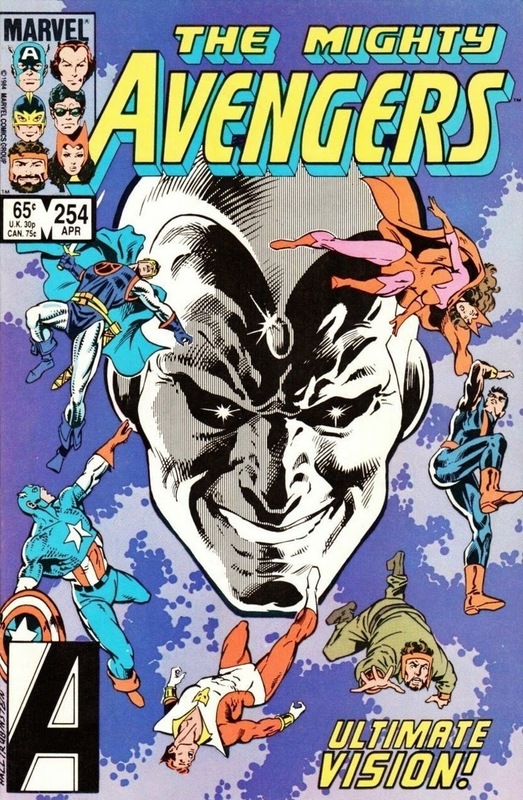 But, the Hank Pym created automaton finally got some depth and characterization during Jim Shooter's 1977 run on Avengers. The Avengers ultimately defeated the sentient, adamantium covered robot thanks to the Scarlet Witch who used her hex powers to mess up its seemingly impenetrable hide and innards. But not before Ultron had taken his Oedipal complex toward Hank Pym to the next level by constructing a bride: the robotic Jocasta who rebelled against her creator/husband and joined the Avengers. As the 1970s drew to a close, Ultron seemed defeated. Unfortunately, even back in the days of transistor circuitry and cupboard sized CPUs, one couldn't get rid of electronic evil all that easily. As November 1980's Avengers I#201 proved, Ultron was about to be reborn. Some outside force had rebuilt the mechanical menace who was now looking forward to enhancing its form with adamantium again. That's why it sent a robot to his dad's house to claim some of the metal stored there. The Wasp tried to stop the robot, but got swatted aside like the bug she named herself after. 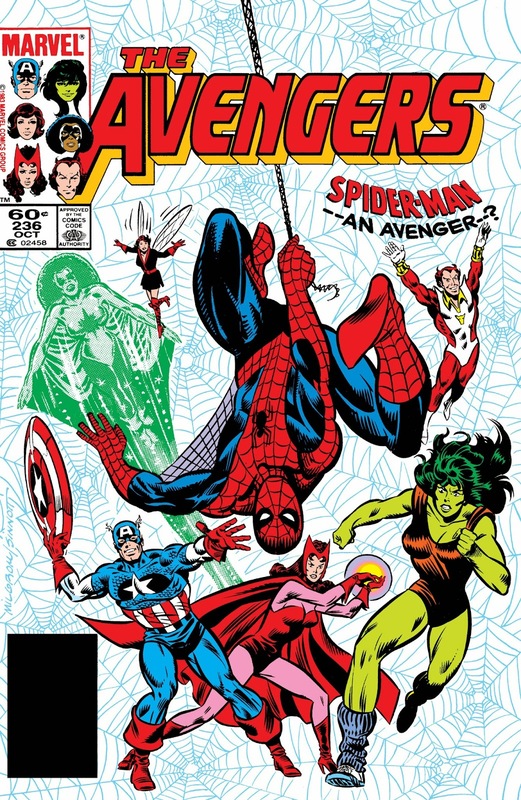 That's why, in Avengers I#202, she flew to Avengers Mansion for back up. "Put her on the couch, Iron Man"
Prophetic words, considering that in less than two years, that's exactly what Tony would be doing to Janet. 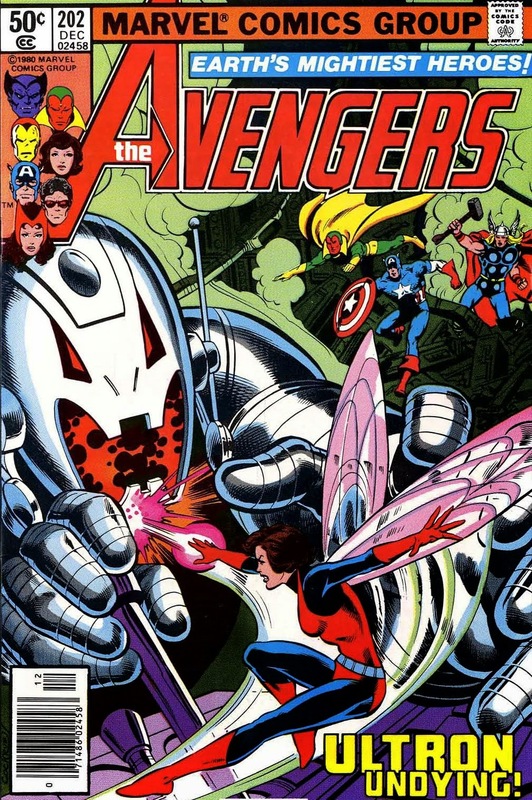 Still, the Wasp explained the situation to the Avengers who concluded that the robot robbing adamantium could only mean one thing: Ultron was back. 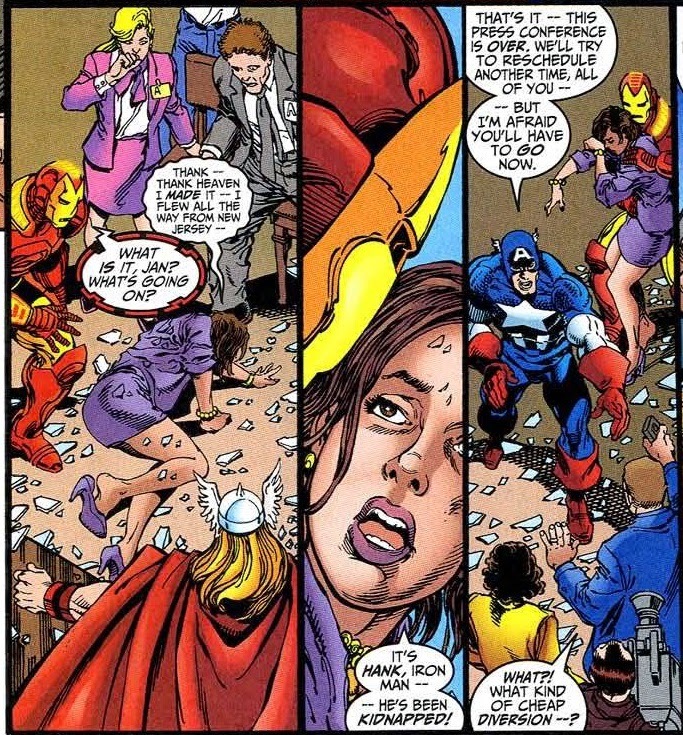 Incidentally, when Kurt Busiek and, once again, George Perez crafted their darn near perfect Ultimate Ultron arc in 1999's Avengers 19-22, they paid homage of sorts to this issue by having the Wasp once again burst through the window to warn the team. "It's Hank, Iron Man... He's been kidnapped!" But, back in 1980, with no clue who was responsible for resurrecting the robot, the team decided to prepare for the worst. Given the fact she'd been their ace in the hole the last time around, Scarlet Witch was kept under tight security at the mansion. 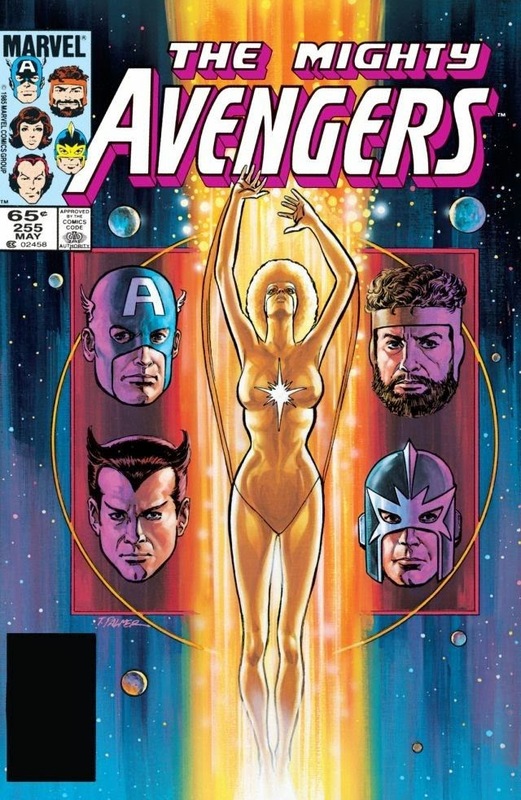 Her husband Vision stood a close vigil, while the entire team was unaware that the true (re)creator of Ultron was... Iron Man. Tony Stark had been affected by Ultron's hypnotic gaze, which planted a post-hypnotic suggestion in his mind that forced the genius inventor to rebuild him should he ever be destroyed. What's worse, Stark acted like Ultron's servant, even delivering the Scarlet Witch to him even if part of him refused to cooperate. Iron Man delivered his teammate to Ultron who had been holed up in a Star Industries plant in New Jersey where he was busy preparing to enhance his form with the stolen, by now molten adamantium. Despite his obvious metal mindset, he wasn't above revenge. He wanted to pay Wanda back for hurting him in the exact same way she'd defeated him: by rendering the witch apart limb from limb. 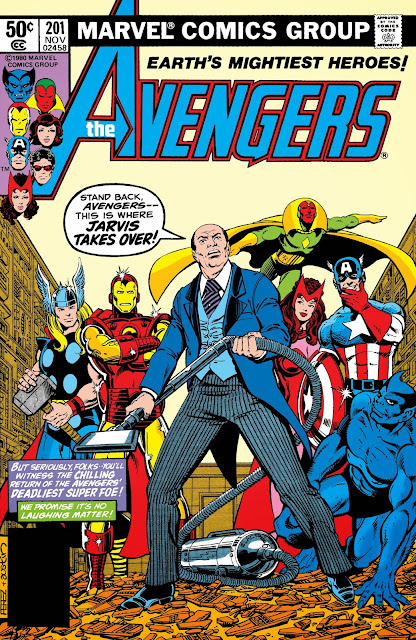 However, before he could get to that, the Avengers traced Iron Man to Ultron's factory thanks to a scanner he'd secretly built and left in his lab at the mansion. And of course, the battle was joined. "Now feel the naked power of Ultron!" 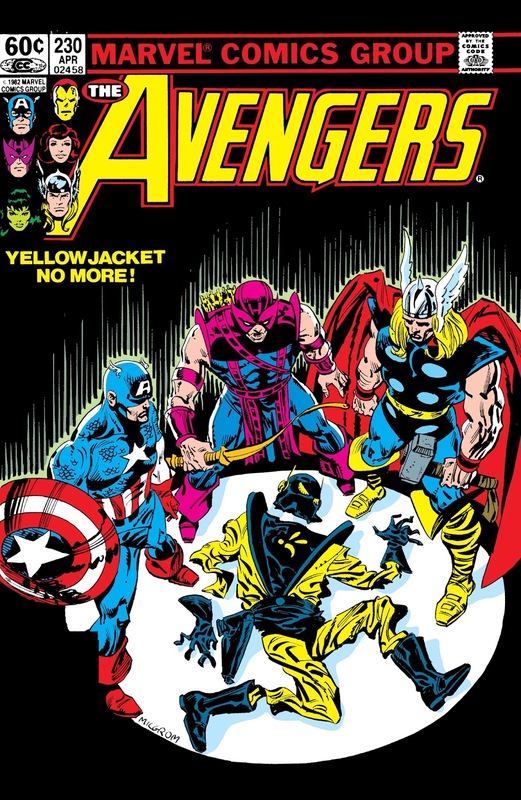 Well, considering Ultron hasn't been dressed ever since he abandoned that "Crimson Cowl" identity in the late 60s... there's really nothing (new) to feel or behold. 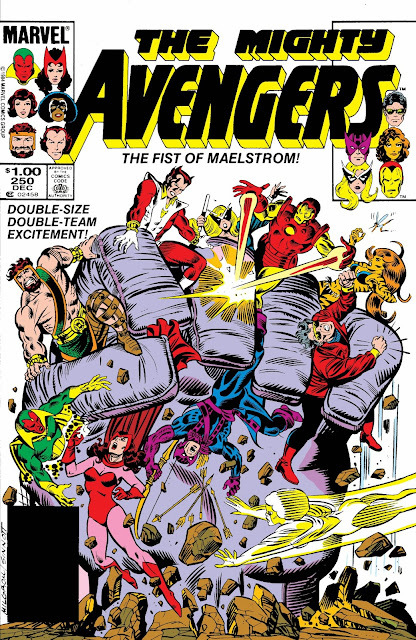 The Avengers did their best to combat Ultron, but even without an adamantium hide he gave the team a run for its money. Movie goers will notice that this David Michelinie/George Perez tale bears more than few similarities to the Age Of Ultron movie. Not only did Iron Man (re)create Ultron, the team consists of Avengers seen in both the comic and the movie. 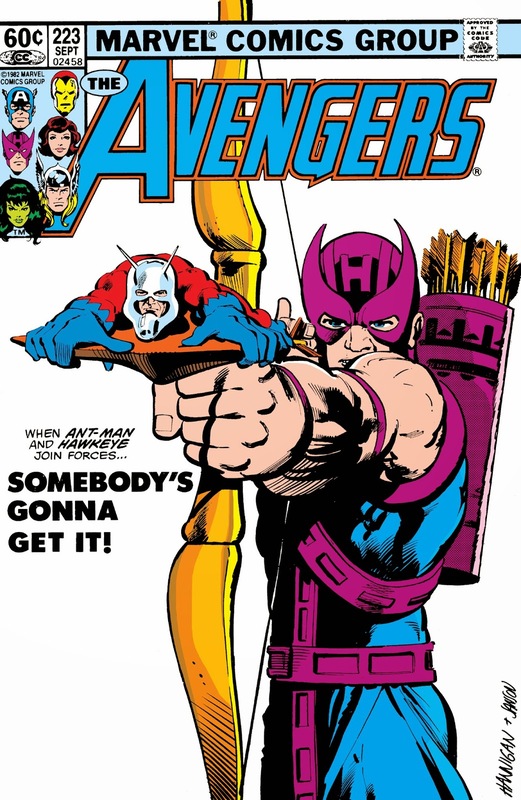 After Hawkeye tossed him into a vat of rapidly setting impenetrable adamantium, the threat of Ultron seemed permanently dealt with. 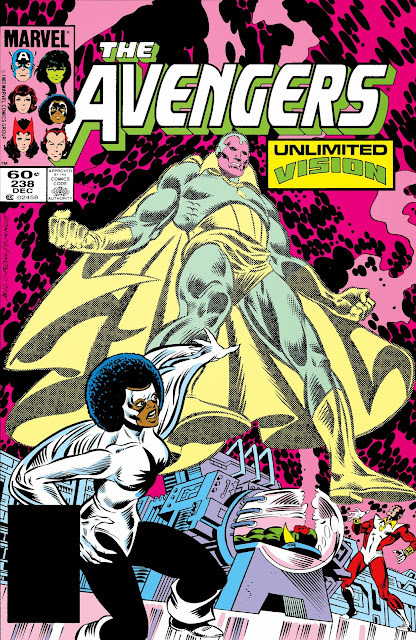 And it was, for a while at least... Because October 1982 brought Marvel Two-In-One I#92 which matched up Thing with Ultron's former bride, Jocasta. She'd arrived at the Baxter Building looking for help. "Something was causing my cybernetic senses to malfunction. I could feel myself slipping away by degrees"
Jocasta was right, something was messing with her senses... And it was Ultron. Getting dipped in adamantium might have trapped him physically, his robotic mind was still able to venture out and contact Jocasta's cybernetic brain. Of course this was still late 1982, usage or knowledge of computers was still extremely limited. 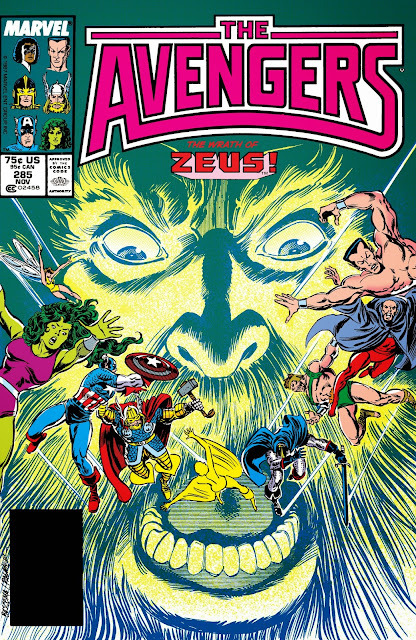 This meant Two-In-One writer Tom DeFalco probably knew very little if anything about hacking, back door programming or Trojan Horses other than the ones from Hellenic mythology. 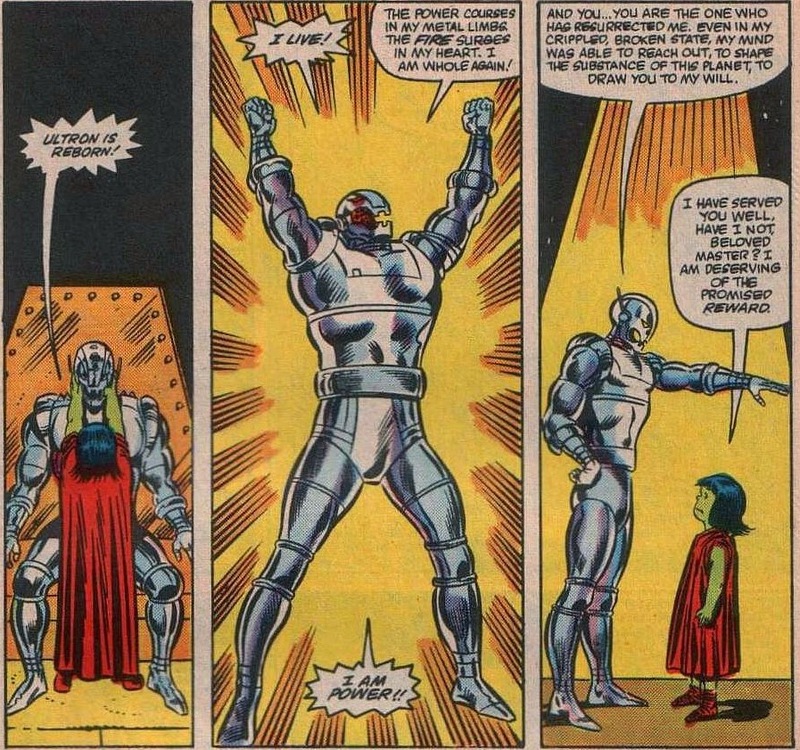 That's why Ultron's take-over of Jocasta literally felt like a bad dream. "... The evil spectre of Ultron may still hang over her..."
Oh my... and ach du lieber... Jocasta. She was staying in one of the FF's guest quarters and decided to take a nap, like humans do, covers and all. During her "sleep" she was influenced by Ultron who forced her to come to him. 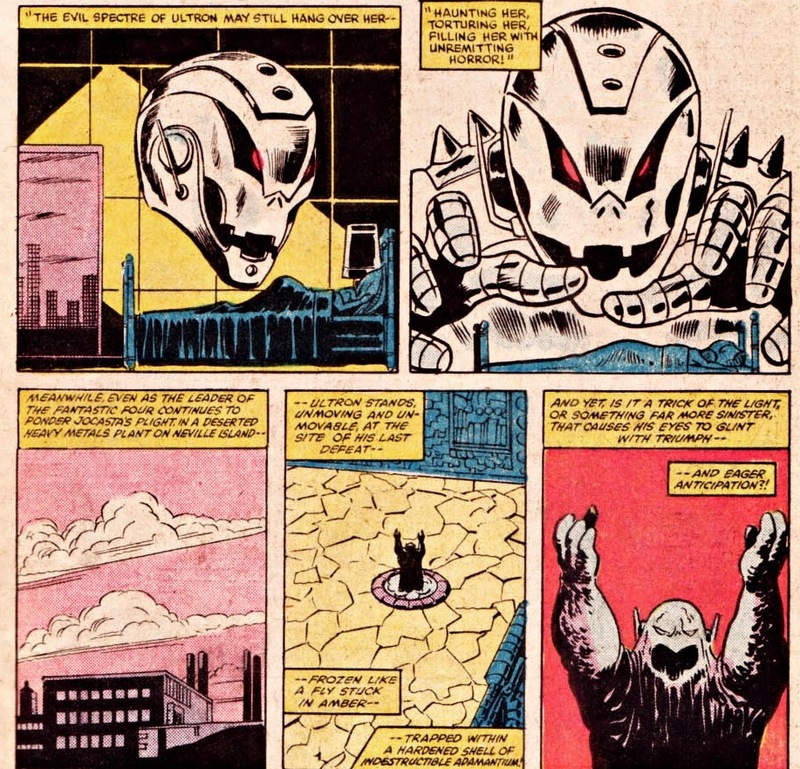 Yes, for some (convenient) reason, Tony Stark had decided the best place to keep the molten adamantium Ultron statue was his otherwise still abandoned New Jersey factory. Perhaps that decision was an after effect of the post-hypnotic suggestion that forced Stark to rebuild Ultron in the first place. Even so, Jocasta was stimulated to come to him and set up equipment that would melt off the excess adamantium that kept him in place. Helping her biggest nightmare return to life snapped Jocasta right out of her cybernetically induced hypnosis. 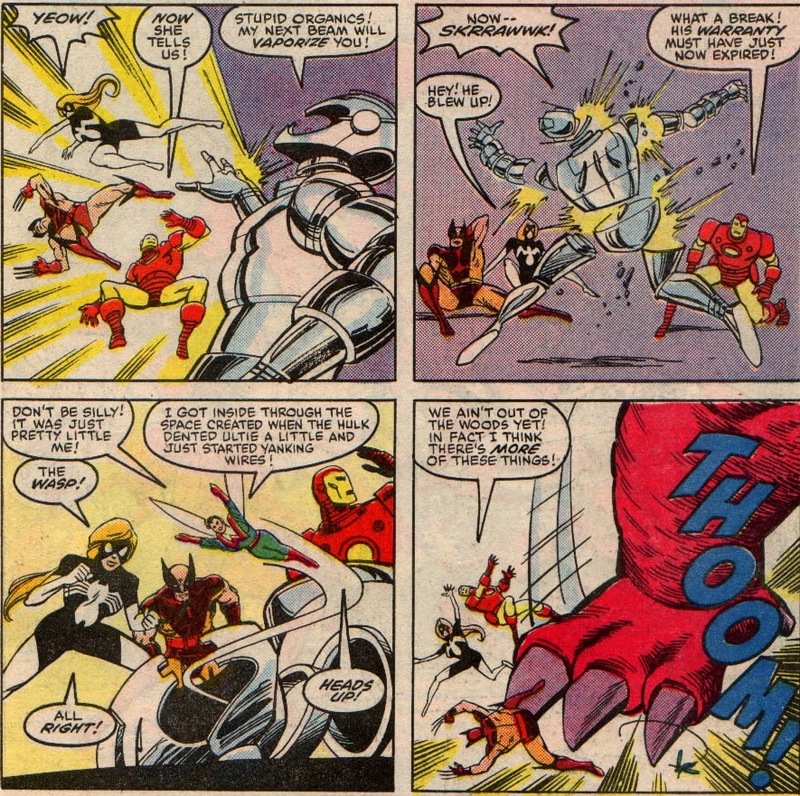 She attacked her master, but much like his creator Hank Pym, Ultron knew how to deal with unruly females... 1980s style. "Jocasta, you are a fool to defy me!" The elongated robotic arm belongs to Aaron Stack, better known as Machine Man. Poor Jocasta, even in a title like Marvel Two-in-One, specifically meant as a vehicle for Thing and another Marvel hero, she gets passed over halfway through the issue for another robotic good guy. Thing had gotten Machine Man to accompany him in his rescue attempt of Jocasta, only to fall prey to Ultron's hypnotic gaze. "SMASH HIM! Pulverize him into scrap metal!" That was the cliffhanger to Marvel Two-In-One I#92. 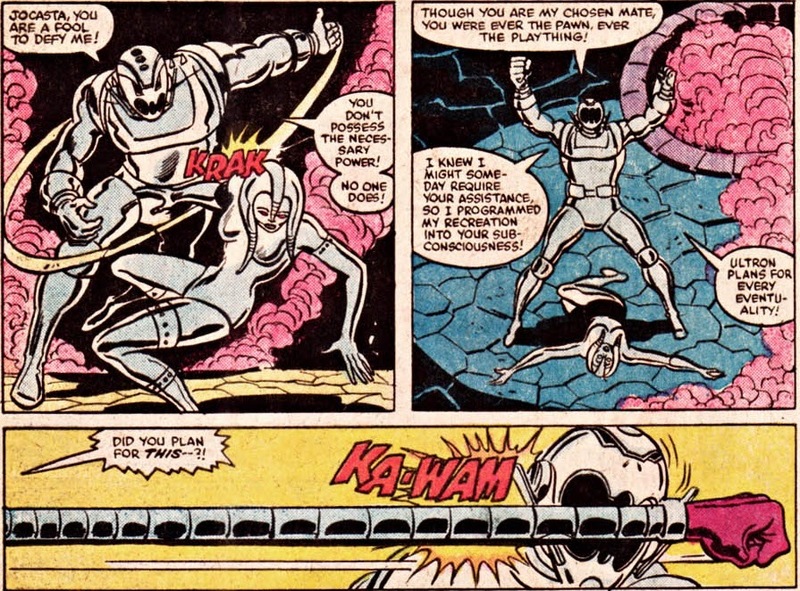 Of course, it didn't take long into #93 for Machine Man to escape with Jocasta. Hijacking Ben's air-cycle, they retreated to lick their proverbial wounds. As they planned for a way to defeat Ultron with Machine Man's ally, the mechanic "Gears" Gavin, Ultron went ahead with a plan of his own. In much the same way Avengers: Age of Ultron features a great number of Ultron drones, the original Ultron decided to have the mind controlled Thing rob sufficient raw materials to create duplicates of himself. 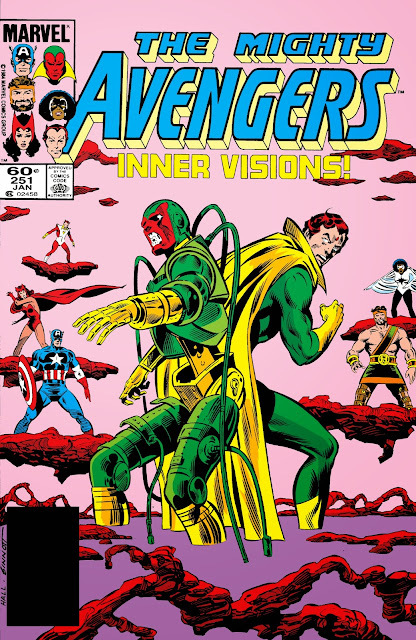 Forget the classic Avengers moment when Vision wept when he was allowed to join, here's a robot who wets himself in an entirely different way. Turns out the best way to take out a cutting edge piece of robotics is by reaching down its gullet and pulling out some of the wiring. 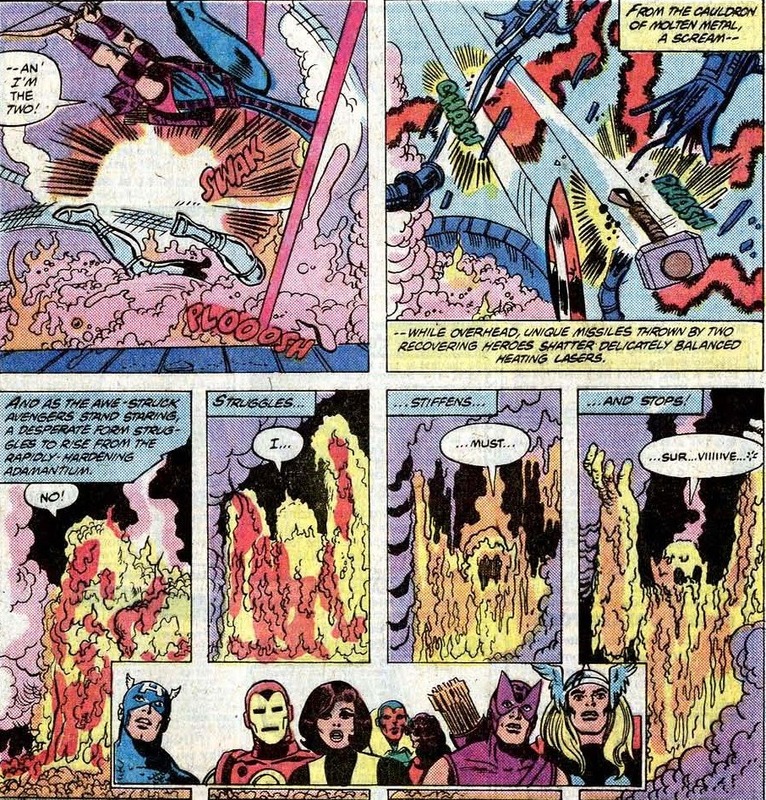 This appeared to be Ultron's ultimate defeat, and for a good year and half it was... Until Jim Shooter decided to include Pym's enfant terrible in the 1984 smash ht Secret Wars. No one knew just how Ultron had survived, but the same held true for Doctor Doom who appeared alive and well in the limited series even though he'd just perished fighting Galactus' wayward herald Tyros. 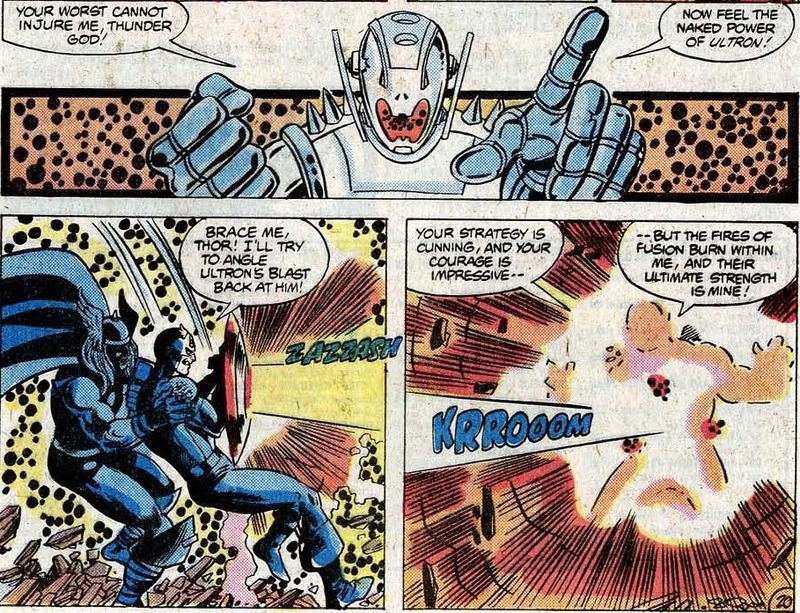 Speaking of Galactus, as Secret Wars I#1 proved, Ultron really had to learn to pick his battles. 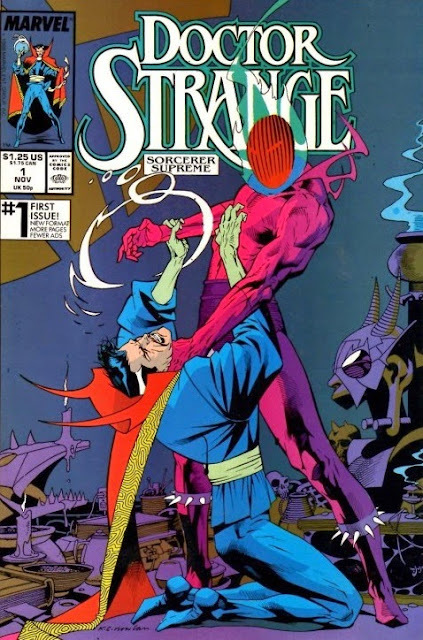 The devourer of worlds drained the arrogant A.I's thermo-nuclear furnace, which offered less than a canape's worth of energy to Galactus but did show readers the stakes that were involved in the Beyonder's game. 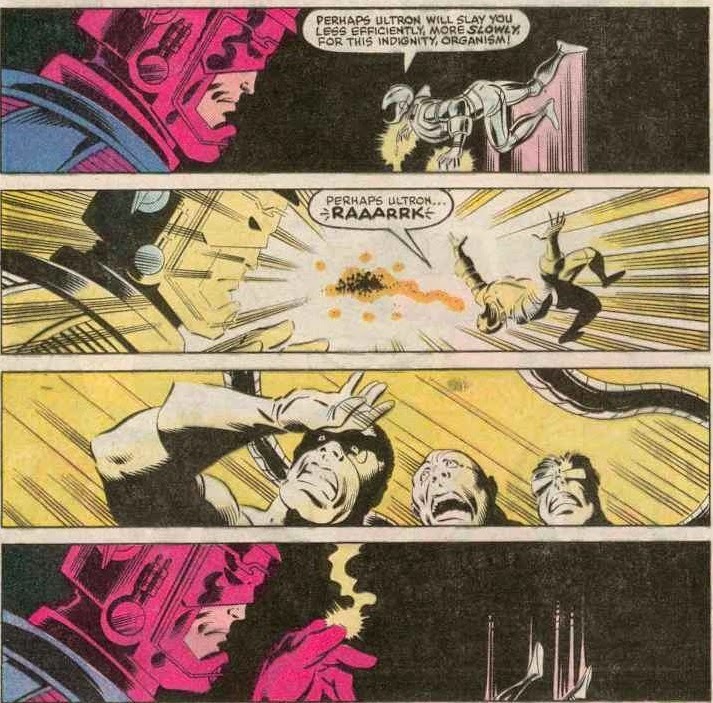 Ultron seemed done for, cannon fodder in the opening gambit of the war, but when Doctor Doom returned to the villains' base in issue #2 following a failed attempt to engage the Beyonder, he concocted a way to make the depowered adamantium killer work for him. "Absolutely indestructible... powerful beyond measure... armed with alien energies even the Absorbing Man cannot absorb... He is mine to command! As are you!" For most of the 12 part series, Ultron served as Doom's personal guard and enforcer. His true personality completely subverted, he didn't involve himself in any of the many fights and confrontations between Earth's heroes, the villains and Magneto and the X-Men. 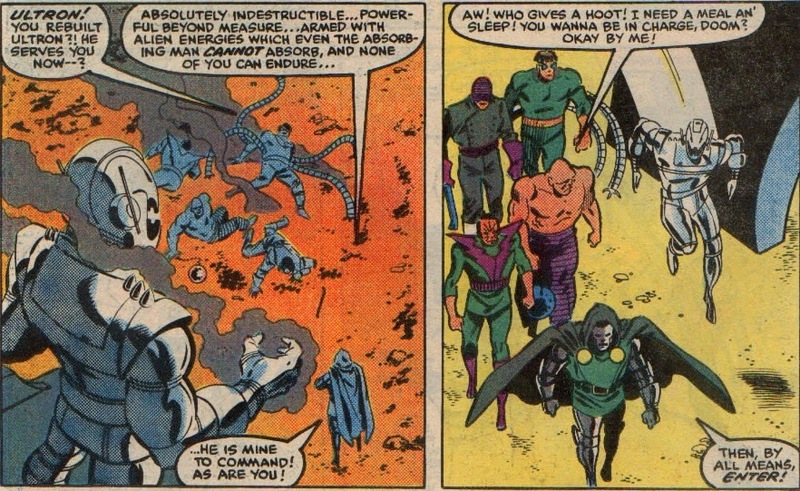 Only when the heroes attacked Doom's citadel did he decide to engage the enemy. Before he could bring himself to bear, Ultron was deactivated by the Human Torch who tackled the robot and went nova on his shiny metal *ss. 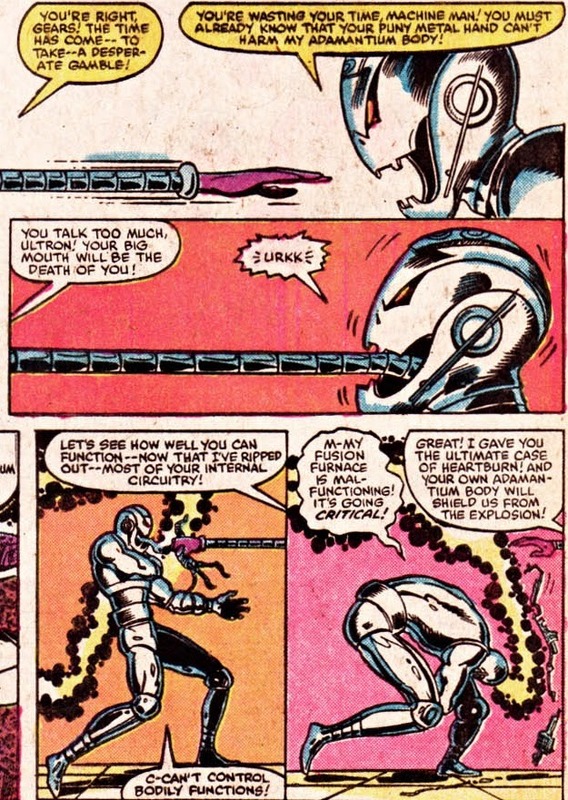 Somehow, Johnny Storm produced sufficient heat to penetrate Ultron's exterior, his cybernetics fused together and he dropped. So much for self repair systems. But, Ultron got yet another chance to prove himself. In #12 he was revived by the Beyonder who had taken refuge inside the form of Klaw in an attempt to reclaim his power that Doctor Doom had robbed from him an issue earlier. "There! Ultron is alive again! As alive as robots get anyway!" "I got inside through the space created when the Hulk dented Ultie a little!" Defeated, the decapitated villain was left to rot... as far as machines can even do that. 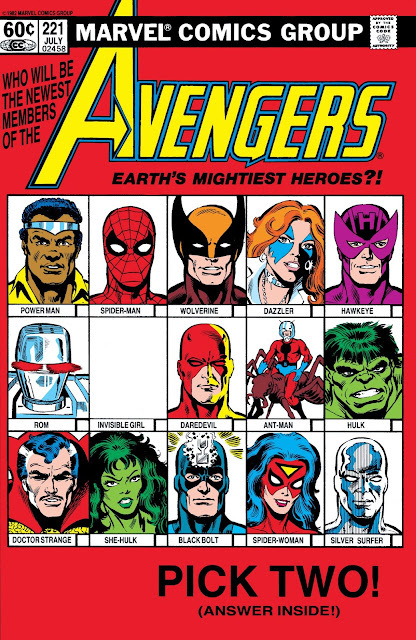 Ultron was left behind on Battleworld when everyone but the Thing returned home. 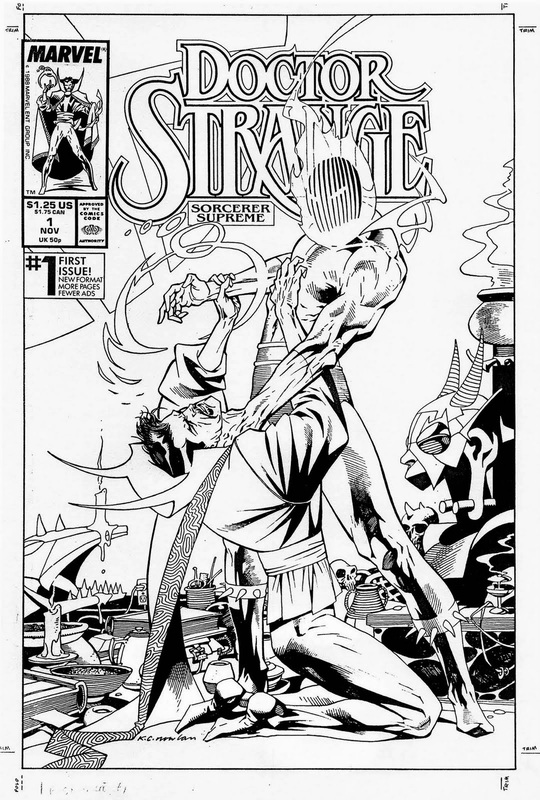 Over the course of a year's worth of stories, Thing writer John Byrne revealed the curious, wish fulfilling nature of the Beyonder's patchwork planet. 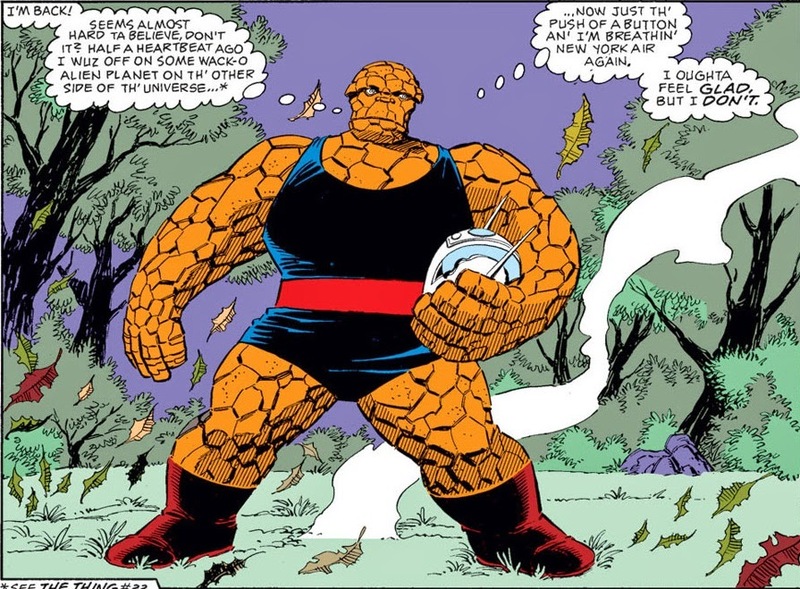 Ben Grimm realized his fondest wishes or deepest fears would all be made manifest, but what's worse... so did the desires of others who were forcibly stranded there because they were unlucky enough the Beyonder chose their slice of planet to form Battleworld. One of them was empress Llrrllllnnllyyrrl (just rolls off the tongue, don't it?) who had come into possession of Ultron's head and had expended the resources of her followers to reconstruct the rest of his body... The empress was convinced that by doing so, she'd get rewarded. Thanking the tiny ruler for her efforts, a charitable as ever Ultron decided to honor her with "the perfect gift, the final gift...Oblivion." He vaporized Llrrllllnnllyyrrl and then announced that with his rebirth, all life "on this pitiful world was forfeit". 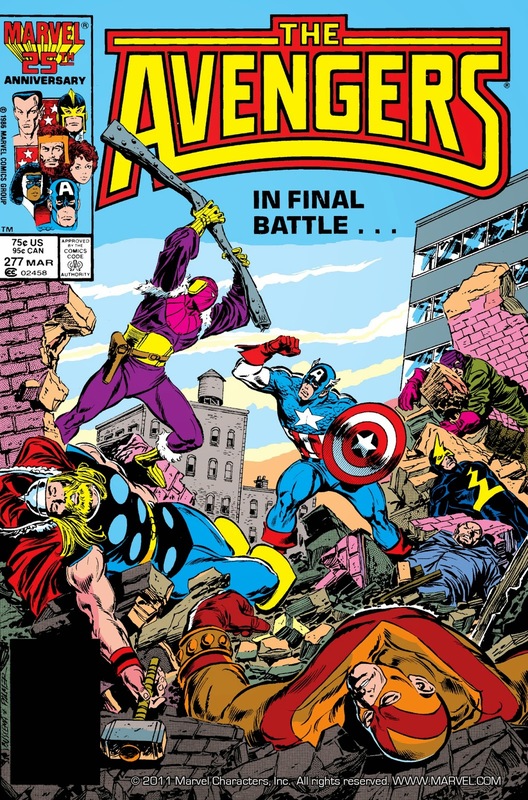 Naturally, because this all happened in Thing I#21 and Grimm's adventures on Battleworld would end in two month's time... it goes without too much saying that Ultron faced off against Ben and lost (his head). Tired of a world that would turn even his most casual of thoughts into potential nightmares, Thing decided it was high time he went home. 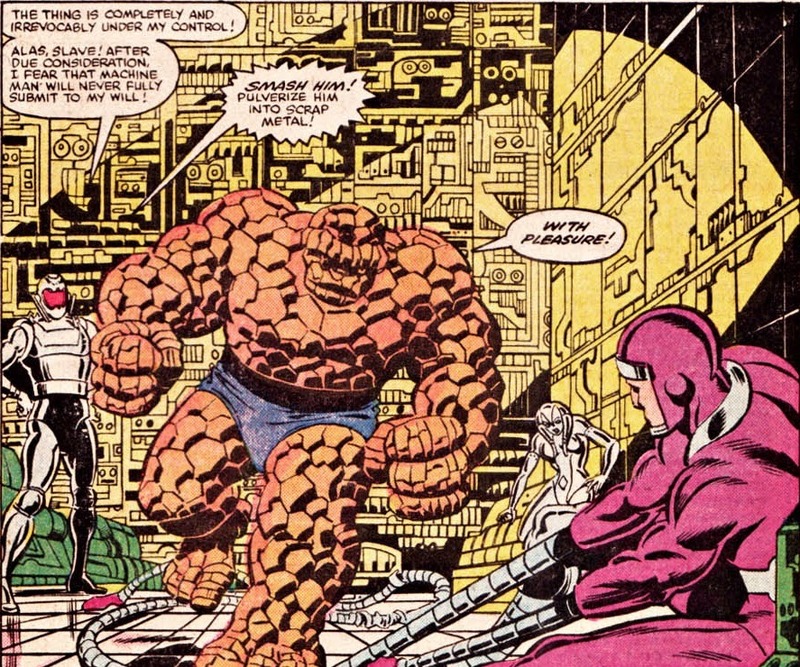 He arrived back on Earth in Fantastic Four I#277, carrying a very familiar memento. Thing's return coincided with the Dire Wraiths' final attack on humanity. 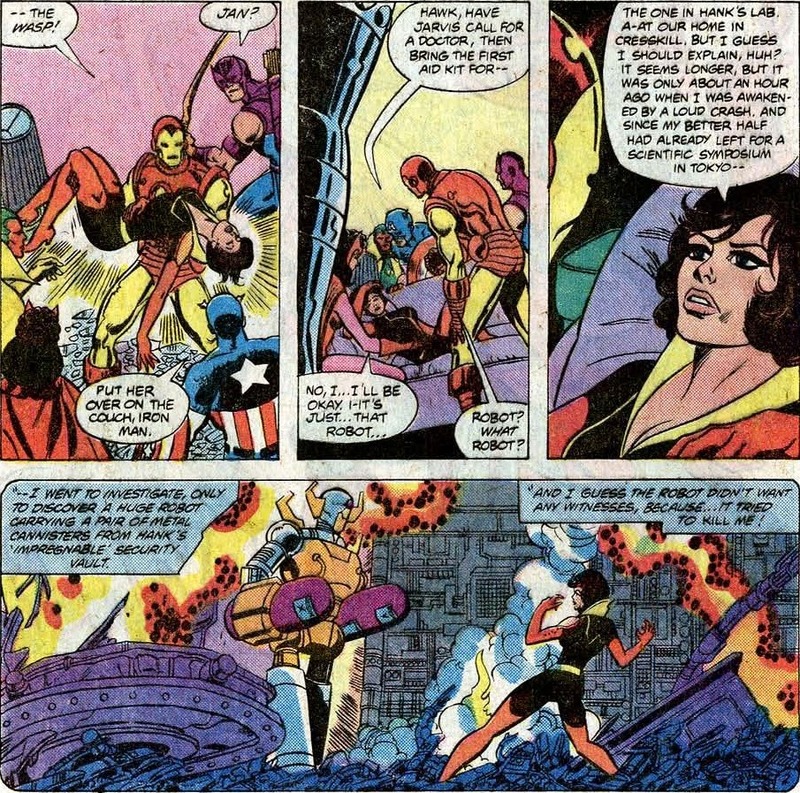 That forced Ben to focus his attention to the crisis at hand (not to mention the shocking realization his erstwhile girlfriend Alicia was now dating his teammate the Human Torch). Ultron's cut off head was pretty much forgotten... or was it? 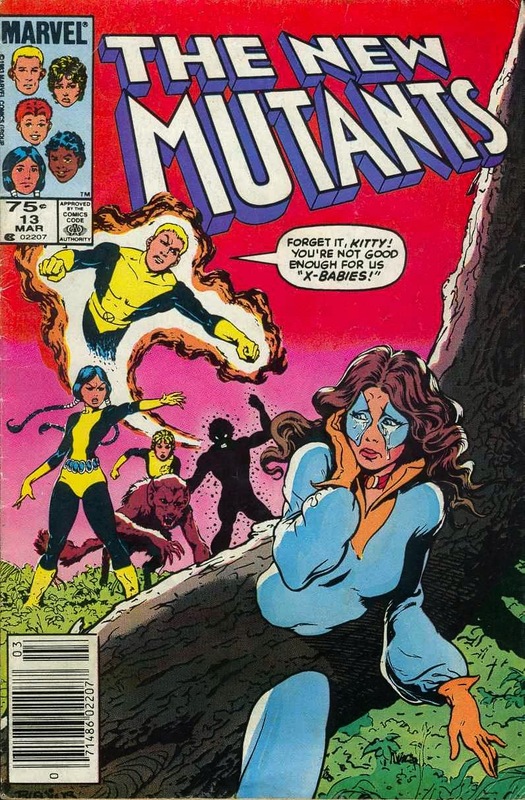 In the seventh and final part of our lookback at the New Mutants' early days, the teens finally wrap up their South American holiday and return home with their newest member Amara, who coughs up a volcano whenever she gets upset... Which she does. A lot. Tell that to the fresh lava plume in your living room, senator. Amara packed her bags and said goodbye to Nova Roma, venturing out into the real world for the first time. Going from ancient Rome to modern day Rio de Janeiro can be quite the culture shock. Luckily, the New Mutants spent another two weeks (!) vacationing in the city. 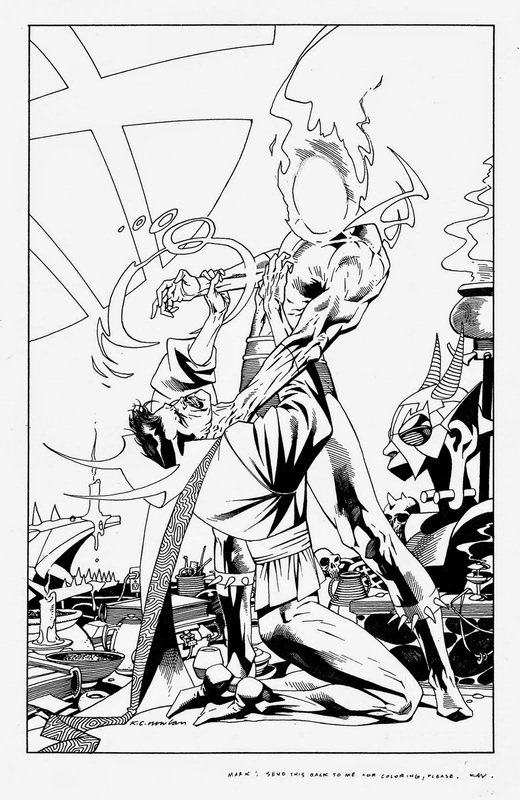 During that time, Sunspot decided to pay his father a little visit, after all it was Emmanual DaCosta's greed that had almost gotten them killed. "Find some other land to exploit. If you make a move into that hidden valley, I'll know." After a heart breaking falling out, Roberto left the man he once called father. Disheartened and emotional, DaCosta the elder made a decision and called a certain New York gentleman's club. 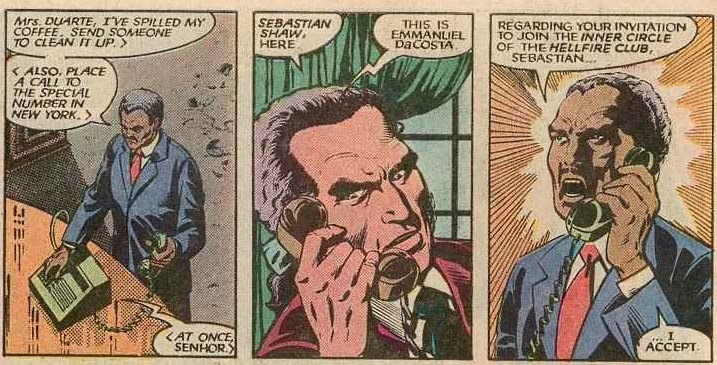 the Inner Circle of the Hellfire Club, Sebastian... I accept." Afraid of her powers and scared she might actually hurt her new friends, Amara ran off. 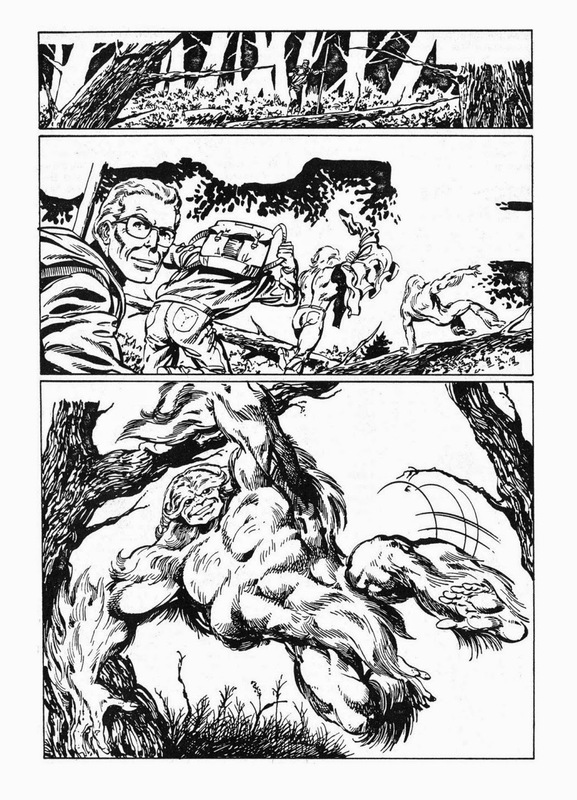 The New Mutants did their best to chase her, but the upset Amara kept triggering tiny tremors that unleased sufficient sulphur into the atmosphere to confuse Wolfsbane's senses. After several hours of walking around in her bikini without sufficient protection, Amara began to suffer from heatstroke and started to hallucinate. In her fever dreams, she unwillingly created a gigantic volcano that engulfed all of Rio in molten rock. By the way, how ironic and unbelievable is it to have the girl who can become lava on legs get stricken with heatstroke? 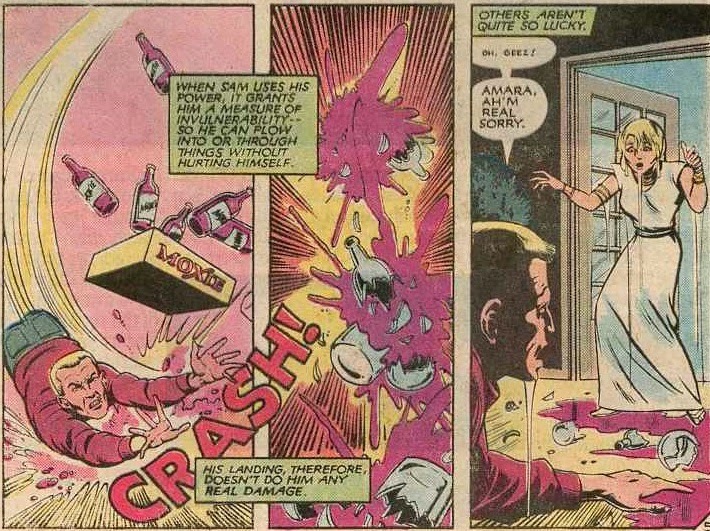 Eventually, the New Mutants tracked Amara down (which wasn't that hard, they simply followed her trail of destruction to one of the favellas where a poor family had taken the delirious girl in. 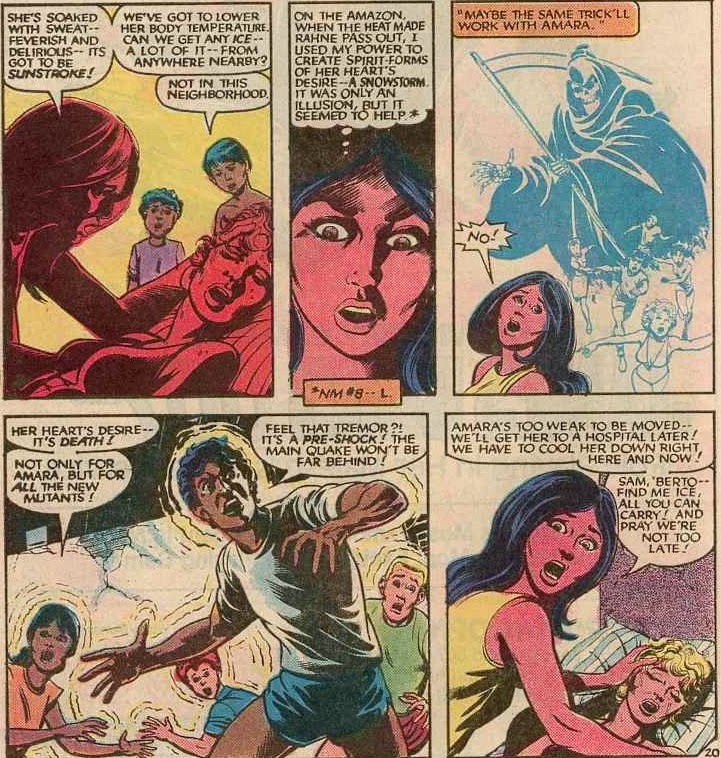 Dani Moonstar quickly and correctly diagnosed her condition. Curing it was another challenge altogether. "We'll have to cool her down right here and now! Sam, 'Berto, find me all the ice you can carry!" "I see now I cannot do so by myself. 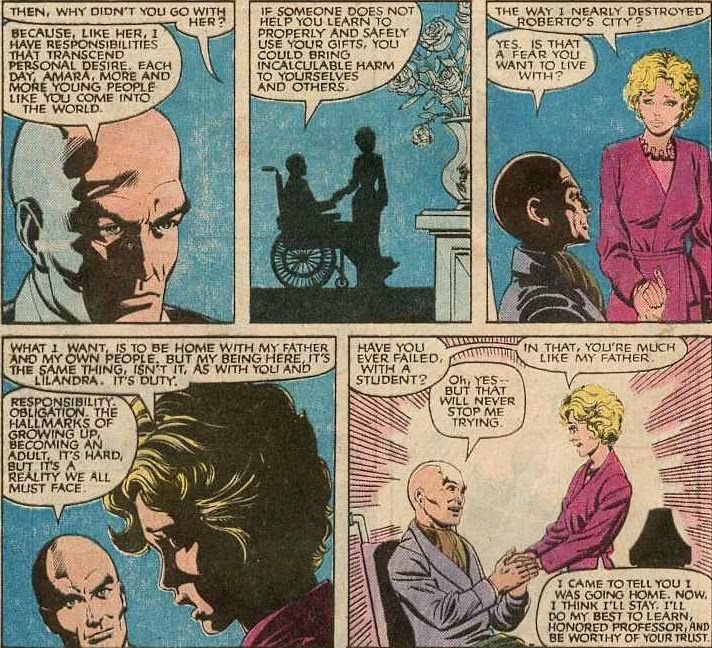 Like it or not, I need your professor Xavier"
We all need professor Xavier, Amara... That's why issue 13, appropriately titled "School Daysze", reunited the mutants with their mentor. A man sworn to protect these minors with his very life, yet didn't think twice to let them roam around Rio unsupervised for a week or two. Now, technically speaking, we're already on the New Mutants' second year in the business. Still, it's necessary to include this issue in the review because it very neatly bookends the New Mutants' earliest days at the school. 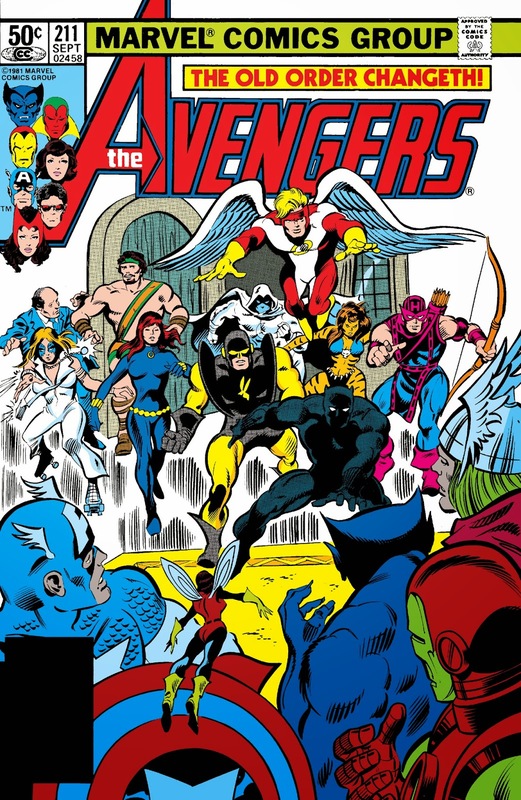 Remember how back in Marvel Graphic Novel I#4, the proto team went to Rio de Janeiro to recruit Roberto Da Costa? A year later they were in Rio again to gain another new member in Amara. In the New Mutants' debut issue, they had their proper introduction to the school and first go in the Danger Room. History is about to repeat itself for Amara. "Professor, are none of my thoughts to be secret or sacred?" A valid and fair question, Amara... Imagine how freaked out you'd be if you arrived at a boarding school on another continent only to find your room was an exact replica of your bedroom back home. Then, the headmaster calmly informs you he telepathically plucked the necessary information from your mind "to make you feel more at home". "I'd best maintain a constant, light rapport with her. That way, I can monitor her emotional state and prevent any accidental tectonic catastrophies." Well, so much for telepaths respecting a person's privacy. You might say the professor isn't actively sifting through her mind, but this "constant, light rapport" is like wire tapping someone's phone or checking her social media output every second of the day. And worst of all, he doesn't even tell her. In yet another attempt to make Amara feel more welcome, the New Mutants decided to throw her a get-to-know-you barbecue. During the preparations, Claremont took a little time to flesh out the New Mutants' personalities some more, finally bringing romance and teenage hormones into play. Amara's arrival had heated things up considerably. 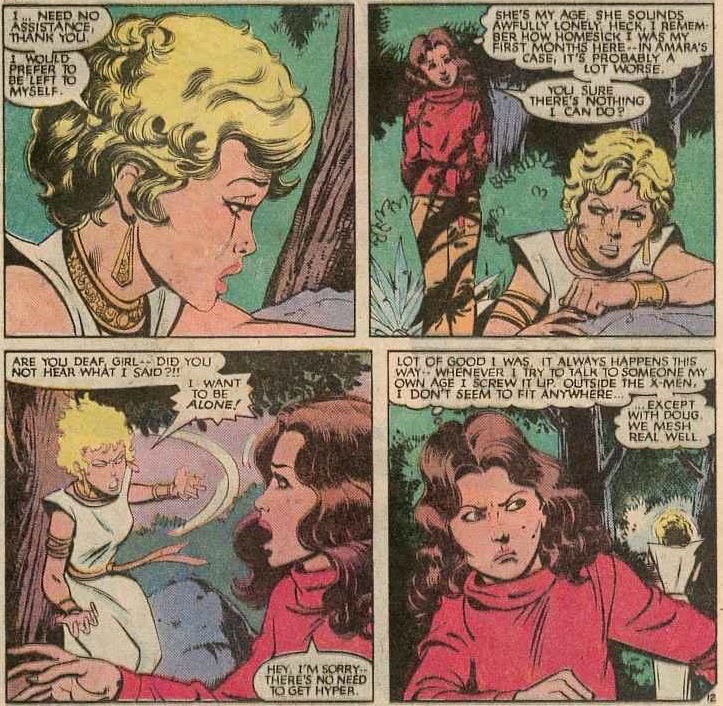 Cannonball was immediately taken with her, which didn't sit well with Wolfsbane who harbored a secret crush on Sam. "That riff's working on Amara, she's actually smiling. I wish he'd use it once on me." Of course, nothing came of this supposed rivalry and Roberto was merely being courteous to Amara, making sure she felt okay about coming downstairs for dinner in her fanciest gown, while the others were dressed casually. Thoroughly embarrassed by the incident, her powers kicked in, accidentally forming a small chasm Dani almost dropped into. Amara didn't even see this, she was too busy running towards the woods behind the school to have a proper cry. It's easy to dismiss her as a big ol' crybaby (and to be fair, she's fairly emotional) but considering her background as a Nova Roman senator's only child, she was raised with outdated ideas on the importance of grace and dignity, both in appearance and actions. Getting covered in sticky grape soda, while wearing your finest attire at a celebration thrown in your honor... Oy, the humanity. And, oy again... how Amara wished she was actually part of humanity. "If he fails... I cannot allow myself to live." Those are some pretty dark thoughts, though plenty of teens have felt so thoroughly miserable at one point or another they briefly entertained the notion of ending it all. And that's even without seemingly uncontrollable, potentially catastrophic mutant powers. 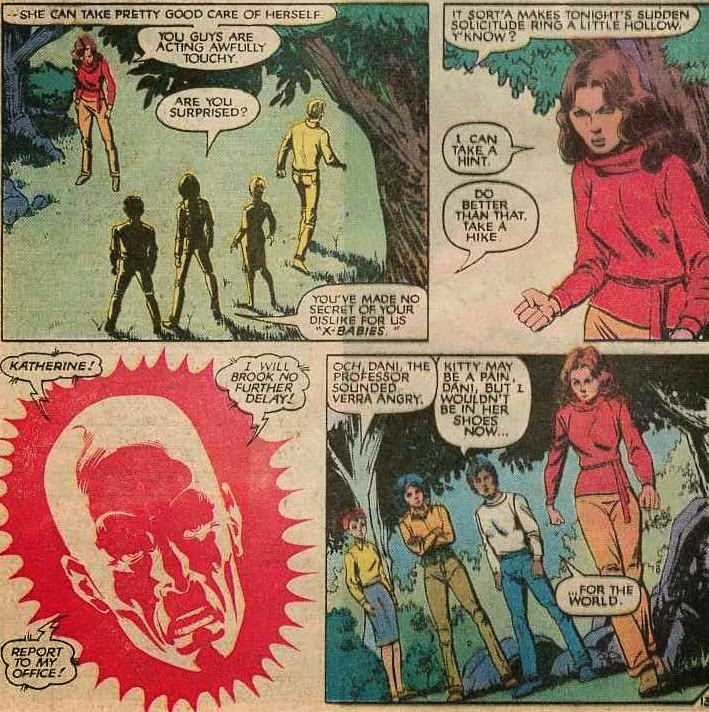 While Amara remained by herself in the woods, Claremont decided to fully benefit from having the New Mutants at the school again by checking in on another young mutant: Kitty Pryde. 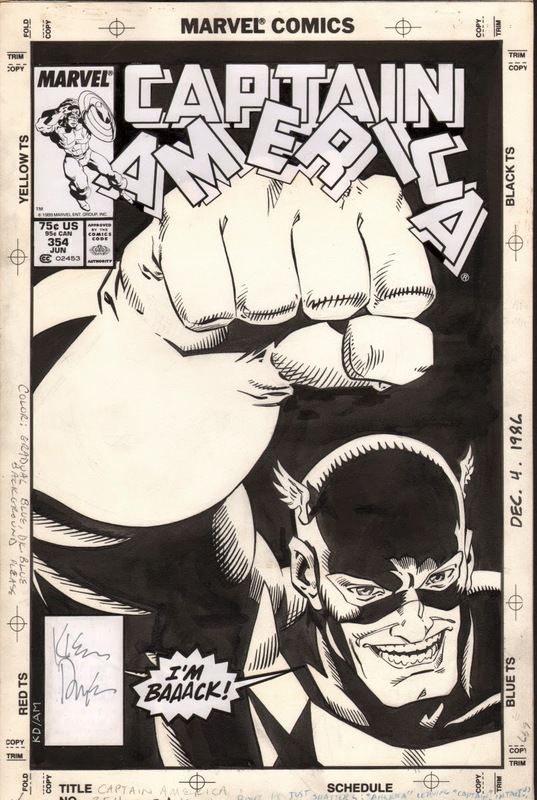 She'd been visiting with her friend Doug Ramsey, in his first appearance. She and Doug immediately hit it off when they met at Stevie Hunter's dance studio and found out they had a lot in common. Computers, for instance... Kitty roped Doug along into hacking into the Hellfire Club's systems only to end up in the database of the government run Project: Wideawake. Their poking around activated a Sentinel that attacked Shaw before Henry Peter Gyrich triggered its self destruct sequence. All in all, Kitty was pretty pleased with herself. "Can they trace us, Doug?" "It always happens this way, whenever I try to talk to someone my own age I screw it up." Shades of Liz Lemon aside, Kitty Pryde was about to prove her own point again when she continued her trek towards the mansion and ran into the New Mutants. Claremont established there was no love lost between Shadowcat and the "X-Babies" as she called the team. 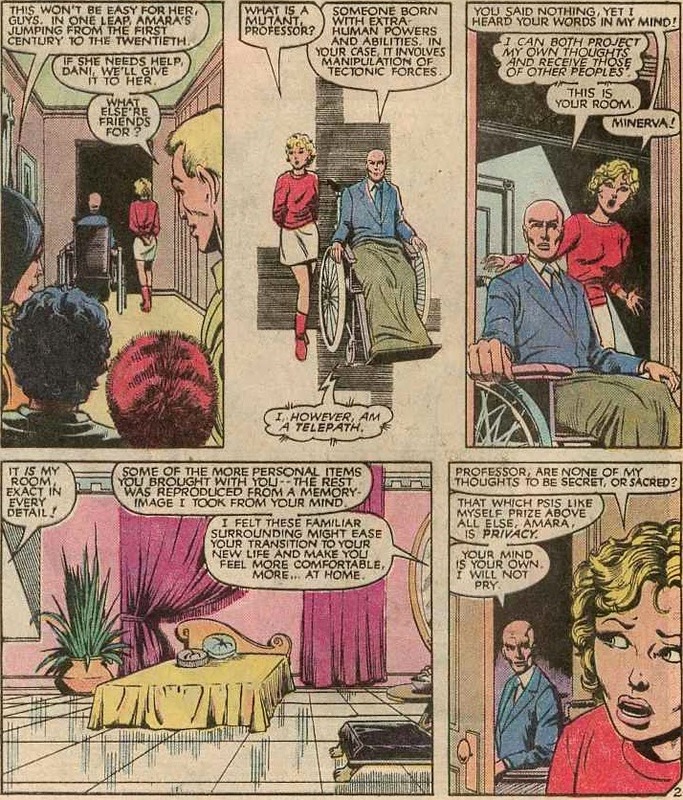 The rivalry had begun behind the scenes of Uncanny X-Men I#168, in which Xavier had briefly demoted her from an X-Man to becoming a New Mutant. 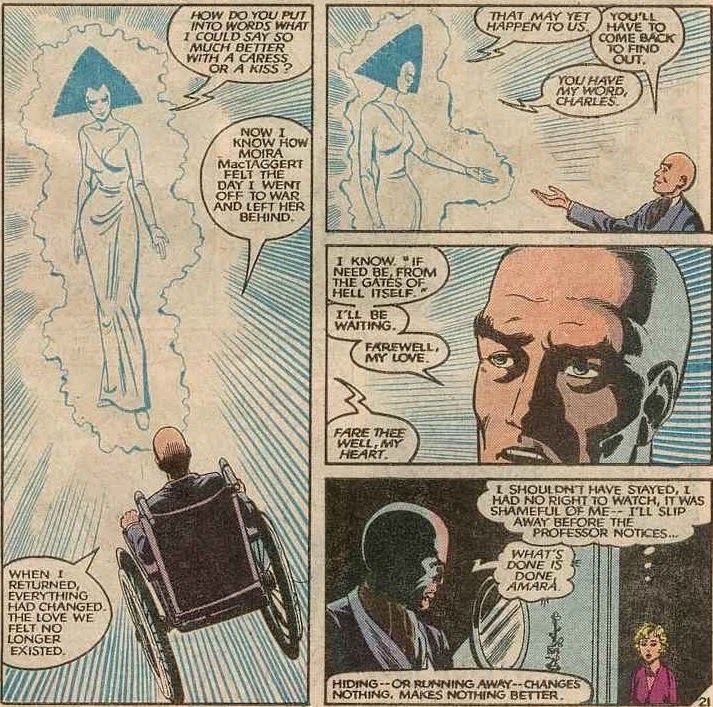 This led to the now classic "Professor Xavier is a jerk!" line. Incidentally, that quote became more and more true with every new misdeed and crime that Charles had committed over the years. "I can take a hint." "... Do better than that. Take a hike." Ouch, talk about a burn. Add to that Xavier's crimson red, furious psi-call and Kitty was in deep trouble. Charles chastized the youngest X-Man for slacking off, missing a scheduled training exercise with the X-Men and continuing to refer to the New Mutants as "X-Babies" when two of them were actually older than her. He then refocussed his attention to Amara, who had sobbed herself to sleep. 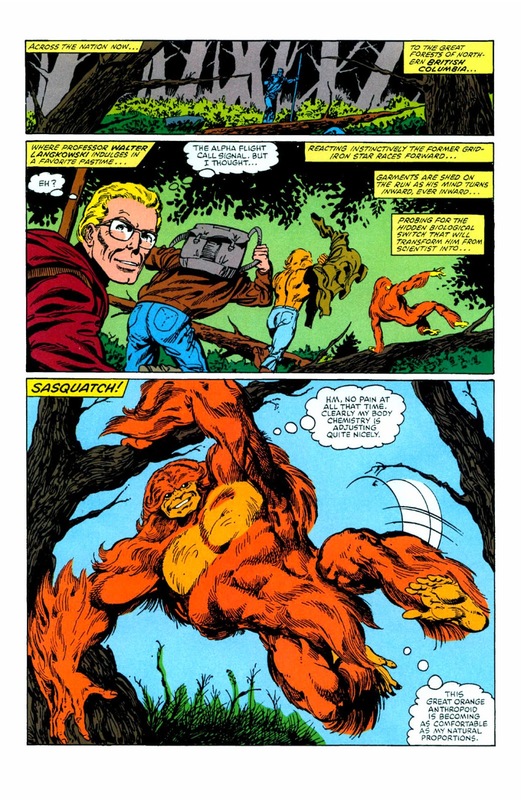 He directed the New Mutants to find their teammate and bring her home. The next day, she was to have her first real go in the Danger Room, complete with X-costume and a brand new codename! Good to see you got a bit more inventive with those codenames after sticking your first batch of students with clunkers like "Beast" and "Iceman", Charlie. 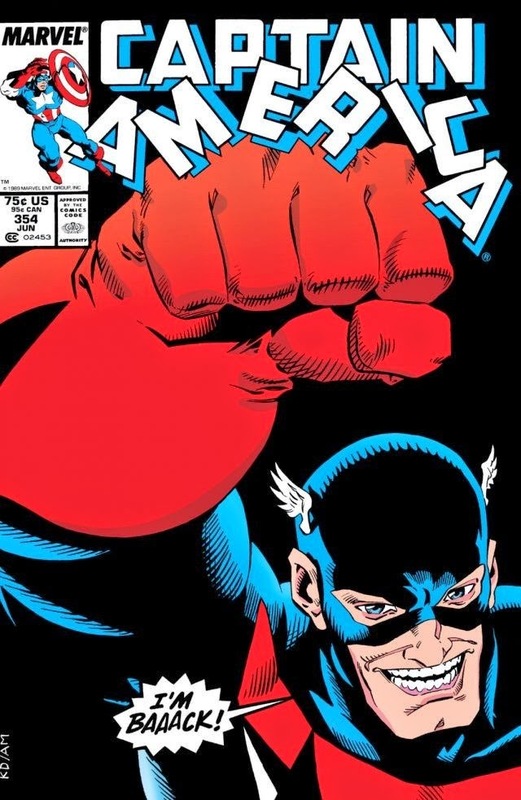 And while Magma is a fine sounding name, how exactly will it protect Amara's identity if her face is still there for anyone to see and recognize? At any rate, Magma freaked out when Xavier proposed she burned through the block of steel lowered into place by Stevie Hunter. Already spooked about having to use her powers, she completely lost it when Charles announced he'd be in her mind to make sure nothing went wrong. 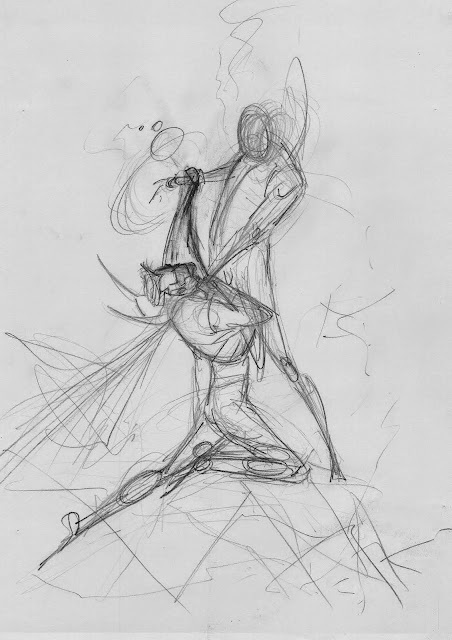 Feeling he had violated his earlier promise, Amara became furious and ran off... Boy, imagine how she'd respond if she found out Xavier had been eavesdropping on her all along? Later that night, when she calmed down a little, Amara came out of her room and went down to the professor's study to make amends. When she neared his quarters, she noticed a remarkable white blue light emanating from his office. Charles was catching up with his ladylove, Lilandra Neramani who had only recently left Earth with the Starjammers in Uncanny X-Men I#174. "I'll be waiting. Farewell, my love. Fare thee well, my heart." Sharing such a personal experience caused Charles and Amara to open up to one another. 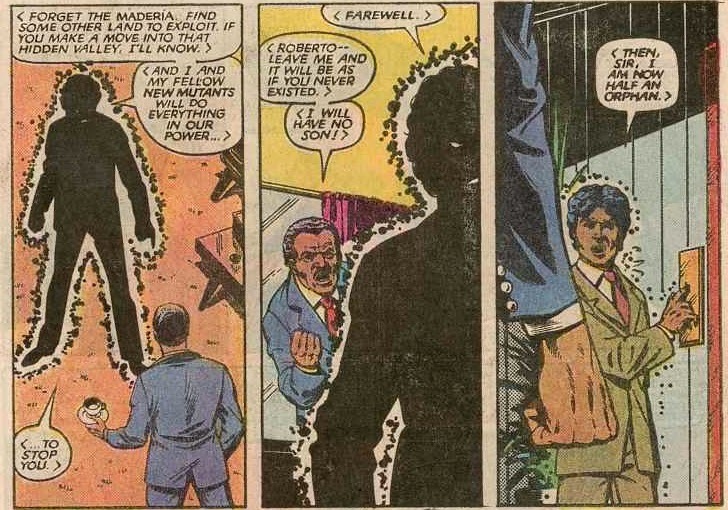 If nothing else, this brief scene showed just how much Xavier himself had grown over the past year as the New Mutants' teacher (even if he sent them away for about 6 months of it). Charles had become far more open and personable, no longer the strict, almost uncaring taskmaster of old who brooked no opposition, handing out demerits like they were going out of style. "Have you ever failed with a student?" "Oh, yes! But that will never stop me trying!" ... Run, Amara, run right now! Go on girl, you're so good at it! 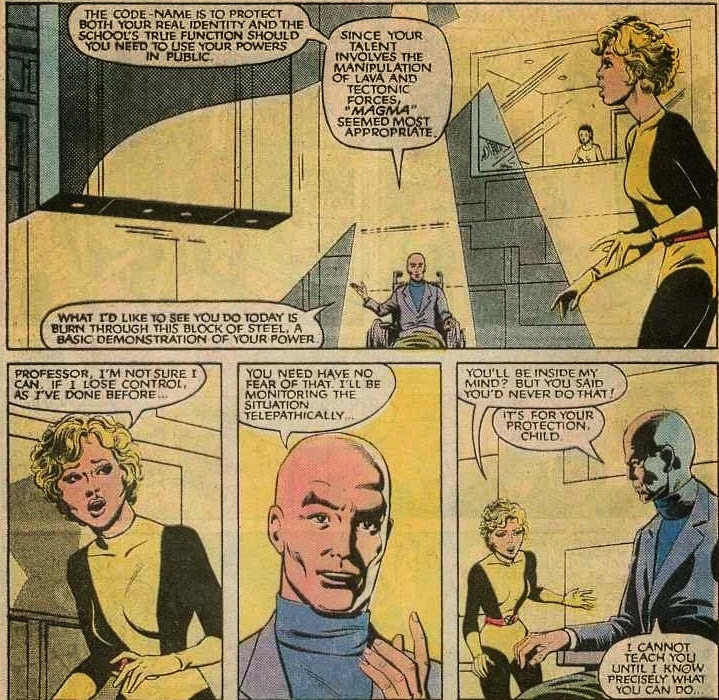 All kidding aside, Xavier had learned to relate to the newest generation of mutants, which was a theme that would continue well into the second year of New Mutants. 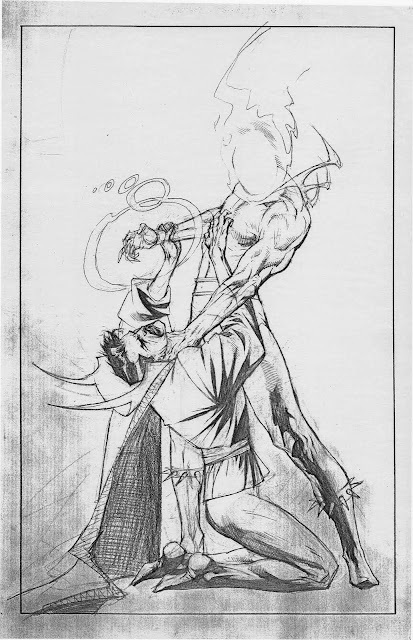 They would gain two more, rather unusual, members in Warlock and Magik. 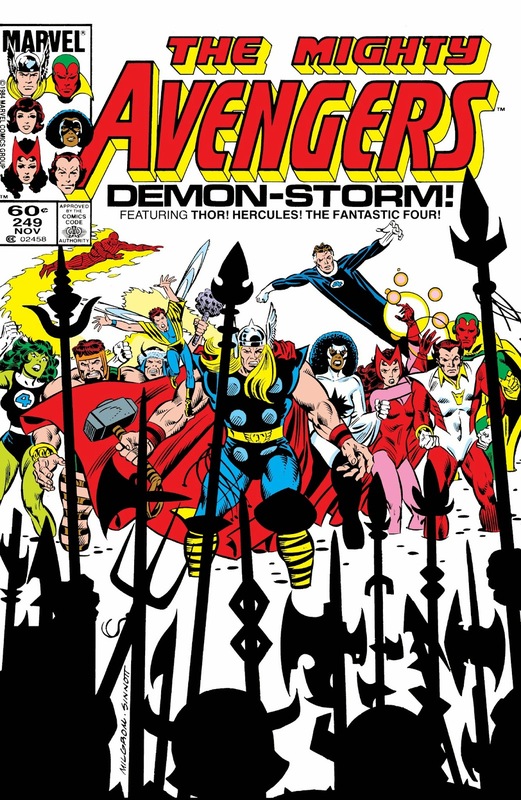 They'd also have the first encounter with their somewhat evil counterparts the Hellions. All that, plus the demon S'ym came a-callin', while Xavier and the X-Men went missing during the first Secret Wars. Not to mention the techno-organic threat of Warlock's dad and the arrival of artist Bill Sienkiewicz looming on the horizon. The teen team was headed for great things in the mid 80s, but none of it would have gotten off the ground if Chris Claremont, Bob McLeod and Sal Buscema hadn't laid the foundation in those initial 12 or 13 issues. 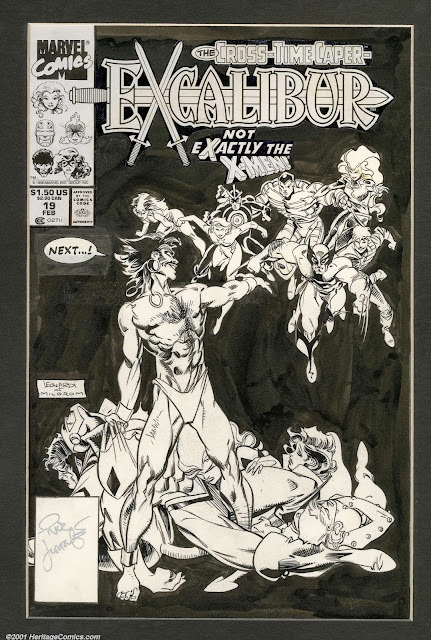 They may not have been the first or last batch of freshmen to walk the halls of Xavier's, but the New Mutants added a lasting class to the X-universe. *with sincere apologies to Billy Joel.